What is the Cathedral Peak Challenge and Challenge Mini? The Cathedral Peak CHALLENGE is a 20km round trip that starts and ends at the Cathedral Peak Hotel and goes right to the top and back of Cathedral Peak, with a total ascent of 1531m. It’s an incredibly tough route through the wilderness of a World Heritage Site on one of the Drakensberg’s most beautiful peaks. The CHALLENGE Mini is an untimed and unassisted route that stops at Base Camp at the bottom of the Summit (less 300m in distance and height). There are 3 categories (Single Female / Single Male / Mixed Team of Two) in the Cathedral Peak Challenge, with a prize of R25 000 for the fastest time in each category. 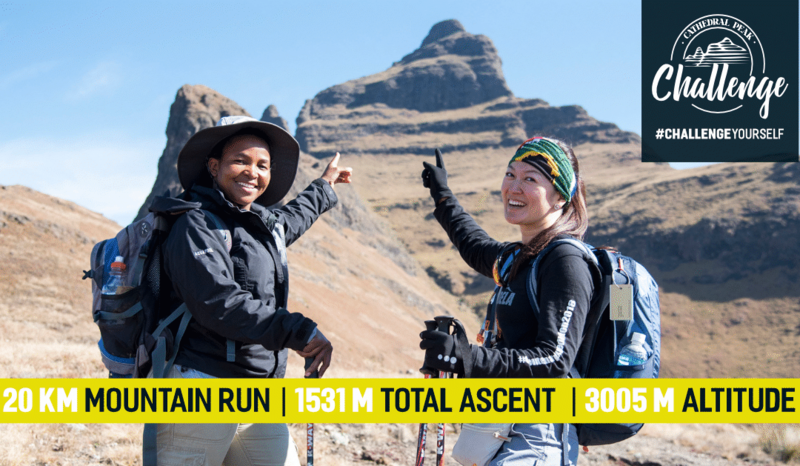 The Cathedral Peak Challenge Mini can be completed on any date between 1 June – 30 September 2018. It’s an untimed and unassisted route, to the Base Camp of Cathedral Peak. There is no prize money for the CHALLENGE Mini. You do it because you want to #ChallengeYourself. WHY THE CATHEDRAL PEAK CHALLENGE? The Cathedral Peak Challenge was born during the discussion of a worrying trend we’d been seeing during the past 10 years. Fewer and fewer guests were walking out into the mountains. Instead they were spending more and more time in and around the hotel buildings. Naturally this is a concern to us as a Hotel surrounded by some of the most incredible mountains in Drakensberg. We have 18 marked trails for people of all ages and all fitness levels to explore and adventure on. We have a guided walk that leaves every morning, and two that leave each week for the top of Cathedral Peak. We have the Cathedral Four, which is an invitation for families to tackle 4 of our walks and receive a medal and certificate of recognition upon completion. We’re a hotel, that over our 75 year history has always been geared to ensure great walking opportunities for our guests. These mountains represent more than just beautiful scenery to look at and take in. They represent an opportunity for us to reconnect with the wilderness. To reconnect with mother nature, and with the essence of who and what we are as human beings. While there is some science to back up this view, there is also magic and mystery at play, as people walk out wracked with stress and anxiety and return back to the hotel after a walk, feeling refreshed and inspired, full of feelings they haven’t felt for a very long time. It is that connection to the wilderness that keeps them returning to Cathedral Peak Hotel and the Drakensberg, year after year. The Hotels in the Drakensberg are full. Our mountains are empty. The Cathedral Peak Challenge and Cathedral Peak Challenge Mini is our invitation to come and reconnect with the Wilderness, to restore some balance, to feed your soul and to #challengeyourself. Cathedral Peak Hotel is offering the following special rate for all participants in the Cathedral Peak Challenge and Mini, during their stay for the Challenge. Above and beyond our normal luxurious amenities that range from our excellent pools to all our on-resort activities you’ll receive the following: Wall climbing, Daily Hikes, Mini-Golf, Lawn Bowls and Pony Rides, all FREE OF CHARGE. This Cathedral Challenge special is valid from 1 June-30 September 2018. Inclusive of breakfast, dinner; morning / afternoon tea, and 15% VAT. This special has limited rooms available. This special only applies to new bookings, and is only available by booking directly through the hotel. Booking Code is CHALLENGE. Please quote when making your booking directly with the hotel. First two people in a room are charged adult’s sharing rate, regardless of age.